If you are looking for information on the Radican's America's Rug Cleaners franchise business opportunity, Radican's Rug Cleaners franchises or Radican's Rug Cleaning franchising, then you have come to the right place. Join the rapidly growing cleaning and maintenance industry without the headaches! With Radican's training it's easy to learn the cleaning, repairing and marketing to start your very own shop. The business requires minimum staffing and the majority of your customers bring their rugs to your shop where all rugs are cleaned and repaired. Cleaning one 9 x 12 Oriental rug in 30 minutes is equal to cleaning three rooms of carpet in four hours. If you enjoy providing outstanding customer service, owning a Radican's franchise is the business for you to take your career to a whole new level. Every day more and more homes are being built with wood, tile and stained cement floors with a decline in wall to wall carpeting. This trend has skyrocketed the use of hand woven and specialty rugs to decorate and cover flooring in homes across the country. 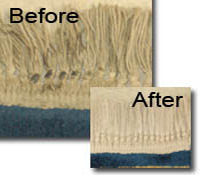 Rug cleaning and repair is a necessary service for homeowners because these rugs cannot be cleaned in the home. Traditional carpet cleaners use heat extractors that ruin these delicate rugs creating a niche that Radican's: America's Rug Cleaners is filling. Minimal Competition: Most cities have only one or two competitors ... or none! When you become a Radican's franchisee, you join a company that was founded in 1946. Our system of success developed during those years will be shared with you to help you build your franchise on a sound foundation. Radican's makes it easy for customers who need rug cleaning or repair. Customers can drop off their rugs at their convenience or Radican's will pick them up. Customers also love the high level of customer service Radican's franchisees provide. We make sure to be attentive to customers' needs and make suggestions to extend the life of their rugs. Each Radican's shop is also conveniently located making it easy for customers to deliver and pick up their rugs while out following their normal shopping patterns.